Mobile software provider Sicap and Switzerland’s leading telecoms provider Swisscom have launched a contactless in-store kiosk that allows prepaid subscribers to top up their phones. The NFC feature of the kiosk allows customers to top up NFC phones and standard phones equipped with an RFID sticker without first having to enter their phone number. 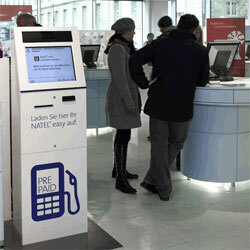 A pilot kiosk was introduced in October 2010 in the main Swisscom store in the country’s capital, Bern. The kiosk has reduced in-store waiting time and enabled staff to spend more time on more complex customer service work. The pilot has now been extended to two other cities, Zurich and Lausanne. “Based on good customer feedback, we are planning to roll out more Sicap in-store reload kiosks,” says Swisscom’s Alexandra Reich.